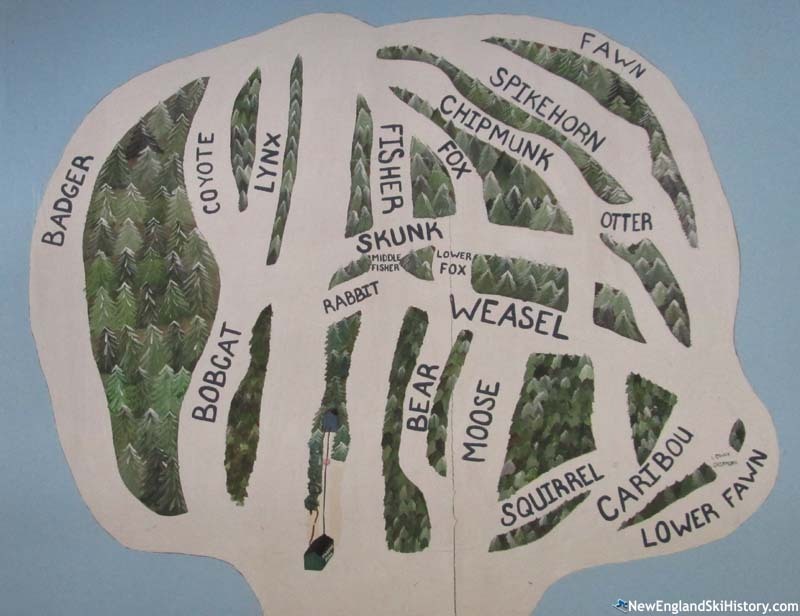 Located east of Skowhegan, Eaton Mountain is a small ski and snow tubing facility. 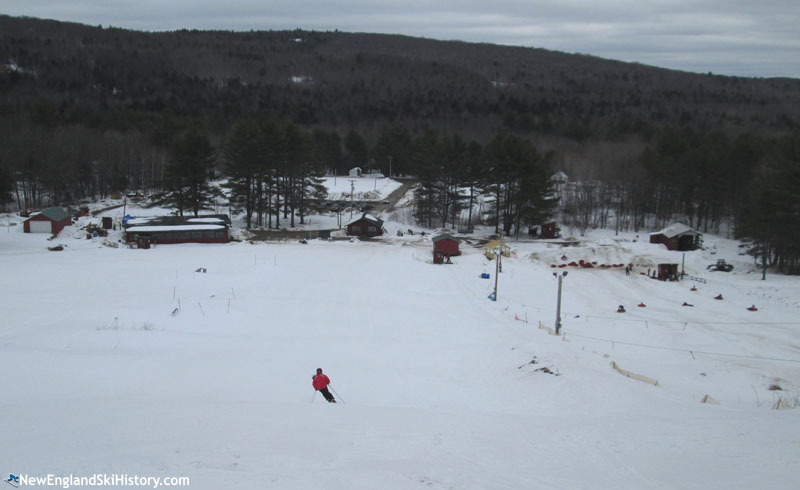 Eaton Mountain's lift served ski history may date back to 1961-62, when a rope tow operation may have started. After the circa 1965 forming of a non-profit corporation, the area was advertised as 'new' for the 1966-67 season, backed by a new double chairlift. It is not known for sure if the chairlift operated that season. Billing invoices suggest the lift may not have opened until 1967-68. Circa 1973, there was talk about Saddleback taking over and improving Eaton, however this likely did not advance beyond initial negotiations. Instead, George Lebrecque purchased the area that fall. Due to a foreclosure, the ski area did not open for the 1975-76 season. Two additional owners came aboard, allowing Lebrecque to reopen the area the following season. Lebrecque would assume sole ownership again in 1980. Taking advantage of a Development Opportunity Fund Grant, a new snowmaking system was installed for the 1984-85 season. Perhaps to hedge against issues with the double chairlift, a T-Bar was obtained from Sugarloaf circa the 1980s. Installation was not completed. The ski area's main lodge and maintenance garage burned in January 2005. Regional areas helped provide equipment to keep the area operational. The ski area closed after the 2007-08 season. 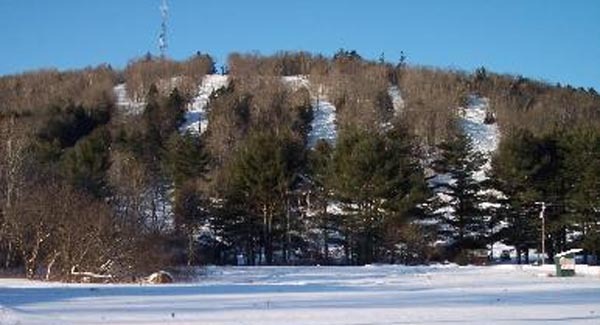 In the fall of 2008, David and Donna Beers purchased Eaton Mountain. While they had hoped to continue ski operations, the area's lifts and infrastructure was in a state of disrepair, resulting in no winter operations for multiple years. After significant work, they were able to open a snow tubing area in 2010 with hopes to resume ski operations soon thereafter. A major setback occurred in December 2011 when David Beers was seriously injured while working on a snowcat. As a result of the accident, the area cancelled 2011-12 winter operations. After a long recovery, Beers was able to reopen the tubing facility for the 2012-13 season. Meanwhile, efforts to resume ski operations continued. Two handle tows were purchased and installed to serve limited skiing operations for 2014-15. Eaton reopened for skiing on January 10, 2015 with the two tows serving a terrain park and novice terrain. After the rough winter of 2015-16, Eaton Mountain suspended ski operations, but continued tubing for 2016-17. Future plans for the ski area call for a lift to the top of the mountain, serving the network of idle trails that are still maintained.